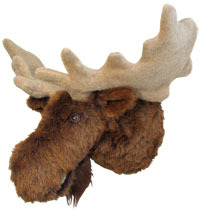 We don't enjoy hunting, so we offer these adorable plush moose trophies! Available in small to enormous they will be a great addition to any room! The male moose, called a "bull," can grow up to seven feet tall. You can drive a VW Bug through his legs! Our Jack is not quite that big, but he is the largest moose in our collection. He's also our only moose with his very own set of choppers. He makes a regal addition to any living room, den or office. He has deep nostrils, and a lower jaw complete with teeth and tongue. Product specs: Stands 23" from the wall with a 26"-28" adjustable antler span and a 40" girth.